Availability is limited. Book early to avoid disappointment. Book online now or call (250)575-SHOW(7469). The success of your event depends on the quality of entertainment you select. You need to find somebody with experience, somebody who’s entertaining, and someone who can read the audience. Kelowna Magician Leif David has been performing for over 24 years across Western Canada. As the Okanagan’s most sought after entertainer you’re guaranteed a show your audience will love. But don’t take our word for it, on each page you’ll find Rave Reviews from past audiences who’ve already experienced the magic of Leif David. We offer several show options to meet the unique needs of your event. Each show features amazing magic and clean comedy appropriate for audiences of all ages and today’s corporate world. Audience volunteers always become the star of the show. During the show volunteers are never forced to come on stage, made fun of, or made to look silly. We provide everything required for the show including a sound system for audiences up to 300 people, plus a backdrop for select shows. This means you have one less thing to coordinate for your event. We offer various 45 minute long magic shows based on the the audience type and venue as well as close-up mingling magic. Have a hassle free magic birthday party in your own home. For children 4-11 years old. 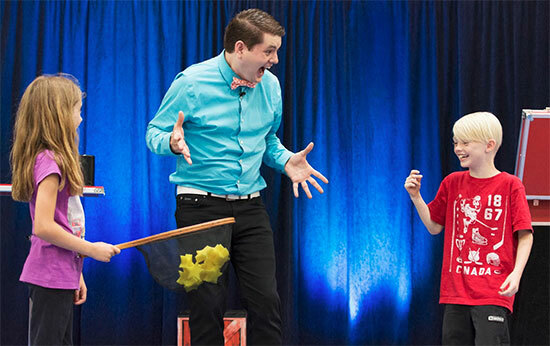 For children and parents alike, this show features audience participation and amazing magic. This show has a focus on entertaining children ages 4-12 year’s old. Ideal for audiences of children, adults, and families of all ages. Featuring magic, audience participation, and comedy. Award winning routines for an adult audience. Ideal for after dinner entertainment. Experience close-up sleight of hand magic in a table hoping or roving setting. Click on your event below to view show packages that would be suitable for your event. Leif David has performed more than 1,200 live shows in the last six years across Western Canada! We found his services highly professional and entertaining and he delighted the broad spectrum of our participants, from the young children to mature adults. We have asked him to come back for future events and we have no hesitation whatsoever in recommending Leif David for other corporate events! Leif was the hit of the night. The kids loved him. You could hear their amazement and excitement throughout the building. Leif David’s act was very entertaining, our staff had a great time! He got the audience involved in most of his tricks including one with our general manager that had our staff in hysterics!! Complete the online booking form and Leif will email you back with show information and a quote for your event. Availability is limited so contact us early to avoid disappointment.